Leaked screenshots from a development and debug tool called iBoot reportedly contain data about Apple’s next-generation iPad. The images were supplied by a source who claims to be in possession of an iPad 3 prototype, according to BGR. Based on the screen captures we see model numbers J1 and J2 (iPad 3,1 and iPad 3, 2) which corroborate with the same model numbers that DigiTimes reported a few weeks ago. It’s worth pointing out, however, that these aren’t two different devices but rather two models of the same iPad – likely a Wi-Fi only and Wi-Fi + GSM / CDMA / LTE to cover all carriers. Perhaps the most important discovery from the debug screens is confirmation that Apple is using an A6 processor, model number S5L8945X. BGR notes that the Apple A4 model was S5L8930X and the A5 is S5L8940X. The A6 is expected to be a quad-core processor which would make the iPad 3 the fastest iOS device to date. Samsung is the likely manufacturer of the A6 for Apple despite their continued battles in the courtroom. 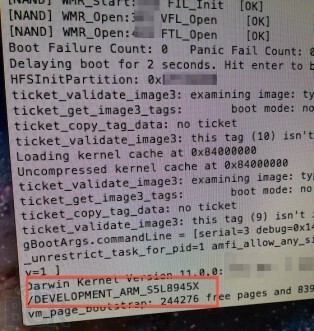 References to quad-core processing were found in iOS 5.1 early last month as first reported by 9to5Mac. The iPad 3 is expected to ship with a QXGA (2084 x 1536 pixels) display and improved battery life. The latest speculation indicates that the iPad 2 will receive a price cut to $399 with the introduction of the iPad 3. The lower price would allow Apple to compete with other vendors such as Sony, Motorola and Samsung that offer tablets at a lower price point. As always, we recommend that you take Apple rumors with a healthy dose of salt. Images like this could easily be faked.